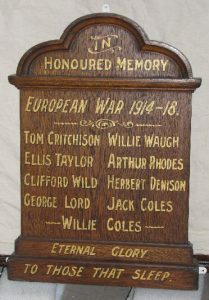 This memorial board is in the care of Cliffe Castle Museum, Keighley. Trefoil headed wooden board with inscription in gold painted lettering. Great War memorial containing nine names of those who died. Believed to have been passed to the museum in 1981. Keighley News report dated 9th September 1994. The origin of this board was unclear until 2016, when Ian Walkden of the Men of Worth Project successfully proved it was from this church.